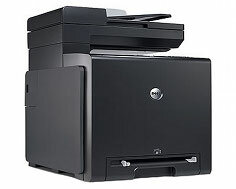 The Dell 2135cn multi-function printer is an ideal choice for a small business or home office. It is an affordable, mid-range choice that offers good, solid functionality with a decent number of features. The purchase price, which is slightly higher than a lower-end unit designed for home and personal use, provides plenty of speed, reliability and reasonably high quality. This is indeed an all-in-one yet economical solution to medium-volume work requirements. Features include printing, scanning, copying and stand-alone faxing for production of professional-looking documents. Capable of printing borderless photos at a resolution of up to 600x600 dpi. The Dell 2135cn is integrated with a 400MHz processor and 128 MB of RAM that provide plenty of processing power for stand-alone tasks. Setup is effortless with installation via USB port. A built-in 10Base-T / 100Base-TX Ethernet controller facilitates connection to a network in order to provide sharing across multiple computers and is equipped with various other enhanced networking capabilities. The Dell Toner Management System is included in the driver package, which is an intelligent software interface that constantly monitors toner levels and provides warnings when toner is low and requires replacement. Additional software features within the Dell ColorTrack package allows for control of user access at the administrator level, allowing permissions to be set which govern usage, access, toner usage and print volume, allowing office managers to more effectively regulate budget costs. Usage information can be tracked using a standard web browser. The high volume print capacity of the Dell 2135cn allows a duty cycle of up to 40,000 pages per month, allowing for medium-volume, medium-demand printing in professional, large office applications. A backlit LCD with a 5-way cursor and numeric keypad allow for ease of use while performing standalone tasks, with an easily visible screen and quick data and command entry. Printer memory is expandable up to 384 MB, allowing for more data storage for faxing, scannign and copying multi-page documents if needed. Copied documents can be enlarged up to 400% of the original and reduced down to 25%. Scan resolution is at 1200x1200 dpi with a true color 24 bit depth. Optional manual document feed accommodates printing of envelopes, custom papers, transparencies and other types of custom media. The Dell 2135cn utilizes the TCP/IP protocol for universal connection to networks with a wide variety of computers, operating systems and servers. Document feeder capacity is limited to 250 sheets, which will require a lot of pauses and paper reloads during the rated 40,000 page duty cycle, while the output tray has a capacity of 150 pages, requiring more setup and reload time during high volume runs. The maximum printing speed is 16 pages per minute for color printing and 12 pages per minute for black and white printing, which is significantly slower than most comparable laser printers. The Dell 2135cn uses slightly more power than most all-in-one printers in its class, consuming 16.8 Watts in sleep mode, 37 Watts on standby and 310 Watts while fully operational. The maximum operating temperature is 89.6 degrees F and the minimum is 50 degrees F, making use in certain environments, such as factories and certain places in the home, impractical and detrimental to the longevity of the unit. Color toner cartridges that are shipped with the Dell 2135cn have only a small fraction of the page yield of comparable printer models, significantly increasing printing costs right out of the box and necessitating immediate purchase of replacement toner in a very short time after initial deployment. Review it: "Dell 2135cn "
Despite the relatively low yield of toner cartridges for the Dell 2135cn, replacement cartridges can be purchased for a very reasonable price, which will help offset increased print costs. Dell ships each printer with 100% toner capacity to help compensate for smaller-yield color toner cartridges that are provided as starters out of the box. Black toner cartridges hold 2500 pages worth of ink, which Dell classifies as high yield, even though this is the only capacity that can be purchased. 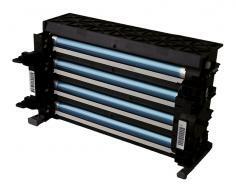 Color toner is available in standard yield, at 1000 pages, or high yield, at 2500 pages, allowing for customization of toner volume to meet demands. 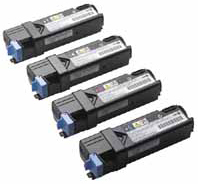 Like a lot of others, toner cartridges for the Dell 2135cn can be purchased through any number of suppliers, in OEM-compatible form or in bulk, for continued savings.